While I spend the majority of my time taking care of my kids and making sure they are eating healthy, staying active and in good health, I often times neglect myself. No that isn't entirely true - I pretty much always neglect myself. I forgot my supplements, do little to no exercise and don't visit the doctor for check-ups as often as I should. Since my iPhone is pretty much attached to me at all times, an app to remind me might be just the thing I need. "The WannaBeWell app is a comprehensive wellness resource that educates, activates and motivates those who are looking to lead a healthier lifestyle. It is based on the three pillars of health at the core of the Life…supplemented program, Healthy Diet + Supplements + Exercise." 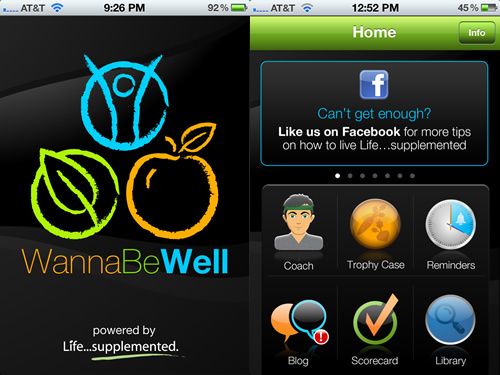 Create your own personalized Wellness Coach to deliver daily motivational and educational messages. 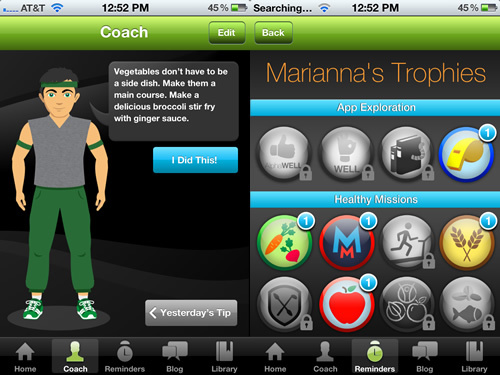 Receive “Healthy Mission” tasks given by the Wellness Coach and collect trophies for accomplishing the tasks. Take the My Wellness Scorecard, a fun, free and interactive online quiz that assesses your current level of overall health and offers tips and ways to improve your health. Find out if you’re an AlphaWELL, an OhWELL or somewhere in between. Explore the Supplement Resource Center, which offers information about dietary supplements in a simple-and-easy to understand format. Access the Supplemental, a blog that provides a forum around healthy diet, supplements and exercise. Set up reminders for you and your family to take your dietary supplements. You can also visit the Life...supplemented website for access to the My Wellness Scorecard quiz and The Supplemental Blog. 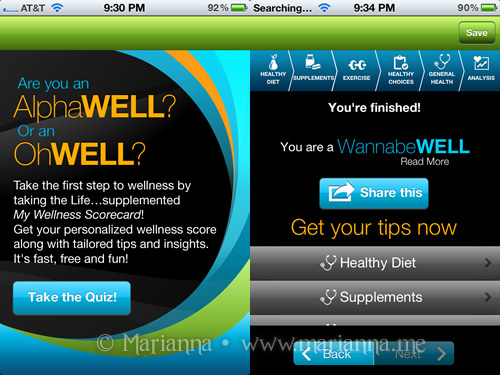 The WannaBeWell app is very easy to set up and get started on. 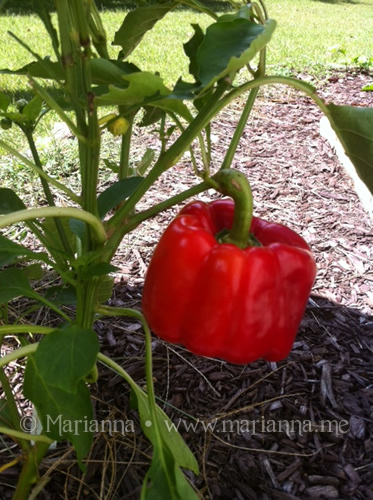 The first thing you will need to do is personalize your Wellness Coach. Your coach will help motivate you every day by giving you tips and challenges. I chose the young man as my coach because truthfully, that will motivate me more than the army drill sergeant. When your coach tells you something you can try, you can indicate that you have done it and then earn yourself a trophy. The part of this app that I probably like the most is the supplement reminder. 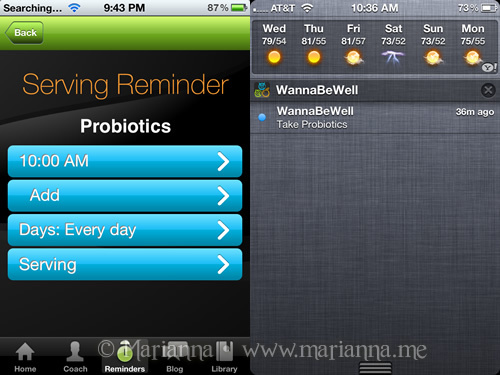 I am always forgetting to take my probiotics and in just a few steps I was able to set up a reminder on my iPhone. Now every day at 10:00 am my phone gives a little chirp and the reminder to take them pops up on my screen. I of course took the My Wellness Scorecard quiz to see where I fell. I ended up scoring a "WannabeWELL" which I imagine is somewhere in the middle. I want to be healthy and fit, but I fall short in my motivation to exercise. Overall I have been please with this app. I like the concept of the coach to help me get motivated with tips. 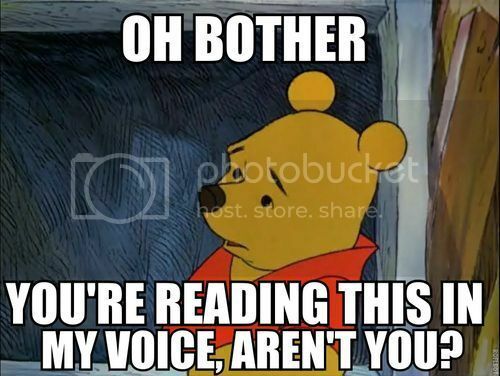 Personally, I would really love it if he yelled at me through my phone, because sometimes I really need that extra kick in the rear. And with the ability to schedule my supplements, I am back to taking my probiotics on a regular basis. 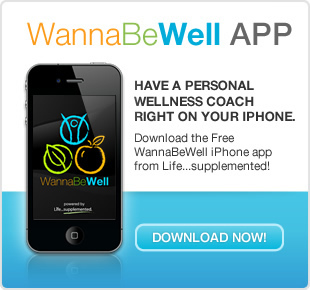 Download the WannaBeWell App for free from iTunes! For each app download, a $1 donation (up to $13,500) will be made to Vitamin Angels. By connecting children under five with vital nutrients like vitamin A, Vitamin Angels are very literally improving the lives of children every day. One vitamin A capsule taken every six months can prevent blindness and reduce the mortality rate of children under five by 23 percent. Now that our oldest son is seven, he is becoming more interested in the computer. He has played a few basic games on some children’s websites before, but nothing more than that. To be honest, I have a hard time sharing my computer time! But I do want him to be able to enjoy the computer and online games while also keeping it all safe. 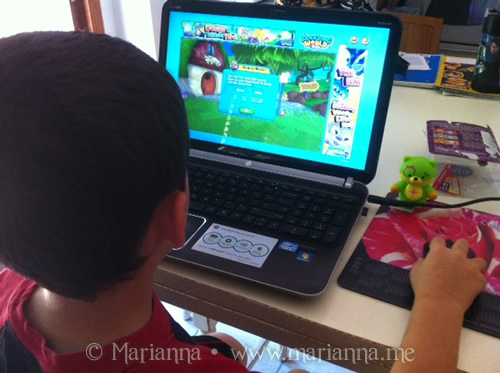 The Amazing World online virtual game from Ganz intrigued me since kids can play for free in a controlled environment. This is important for me because it means he can’t accidentally delete my programs and files or click on a non-kid website. Needless to say he and were both very eager to give it a try! 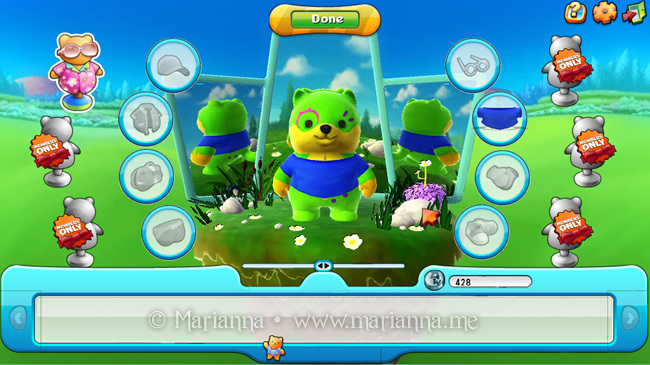 The great thing about Amazing World is that the game is free-to-play and kids can register with a generic “Zing” at AmazingWorld.com. You do not even have to purchase a toy. 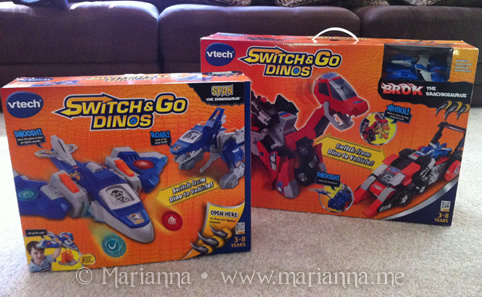 However, integrating the virtual play with an actual toy makes it all the more special. 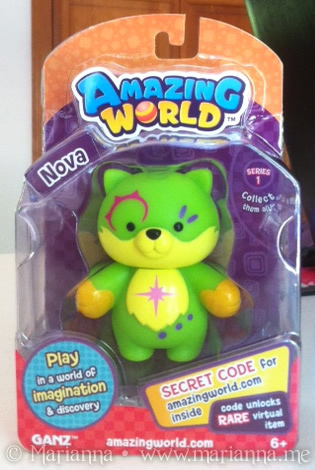 When you purchase your own Zing figure, it comes with a special code that you use to register your Zing online. This code unlocks your virtual Zing, which looks identical to your toy, and it comes with one special item to place in your virtual house or yard. Once you download and install the free software, which took me about 25 minutes on DSL, then you can register your Zing and start having some fun. In order to progress through the levels, your Zing will have to complete special quests. 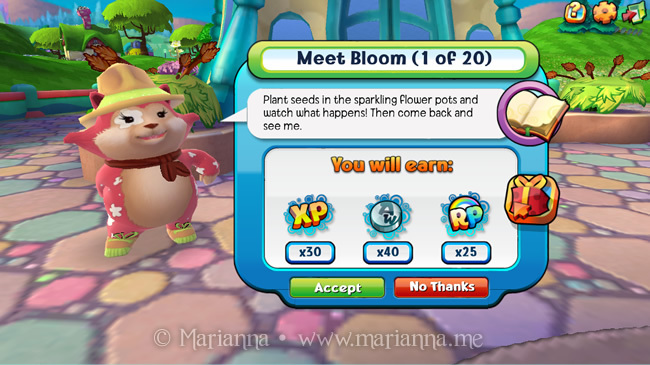 Some of these quests might be planting seeds or meeting other characters within the game. One quest my son really enjoyed was exploring and jumping around a building to catch butterflies. By completing quests, you earn experience points, relationship points and coins and sometimes even a special item to place in your home. 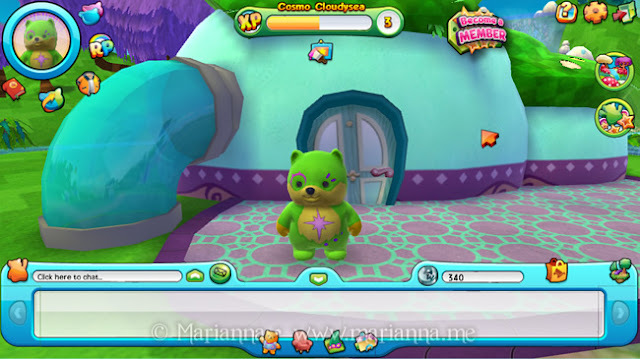 The coins can be used to purchase items in the virtual store likes clothing and furniture. My son not only loves the fun of working on the missions but he is also proud of himself when he completes one. It gives him quite a sense of accomplishment. And as the parent, I like that the quests are just challenging enough for him to enjoy and have to work a little at, but not too difficult that he becomes frustrated with the game. He also really enjoys decorating his space. As your Zing continues to move up the levels, you can even build rooms onto your house to make it bigger. 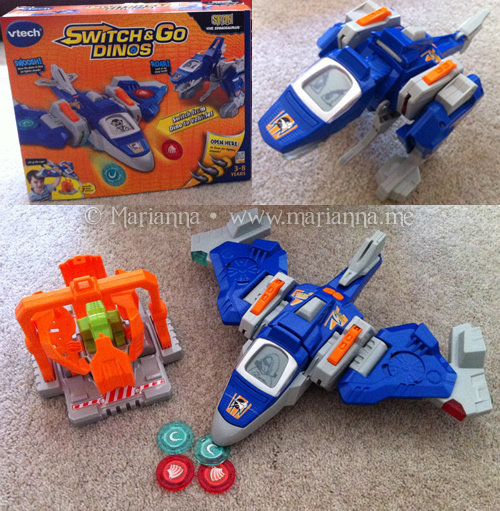 Kids can spend hours having fun decorating and customizing everything in their own Amazing World. Your free-to-play account on Amazing World will cap off on level 20. If you want full access to all 50 levels, access to all items in the store, unique quest prizes and more than you can become an Amazing World subscriber. Subscriptions may be purchased on a three month, six month or one year basis. Whether you choose to play for free or purchase a subscription one thing can be sure – your child will have a lot of fun! 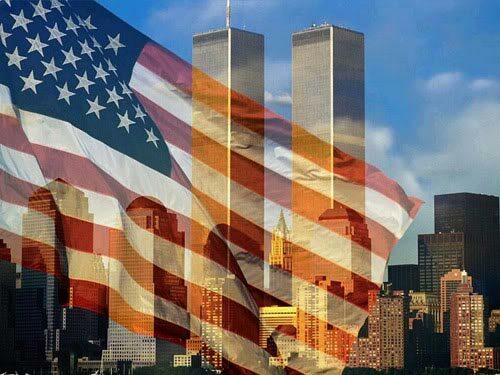 Tweet anytime between 9/11 and 9/23 at 11:59 pm EST. 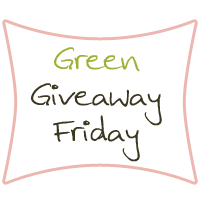 Each tweet will earn you one entry into the contest! 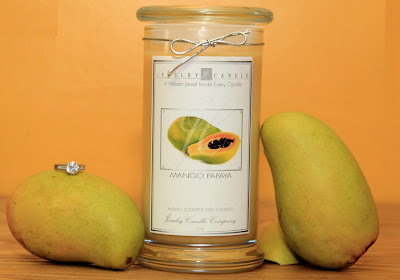 Winner will be notified via Twitter. Good Luck! Now head to Amazing World and register your Zing now! It is free-to-play! I will see you there! I've already put together my list of what I want for Christmas this year and it consists of just one thing: the iPhone 5. 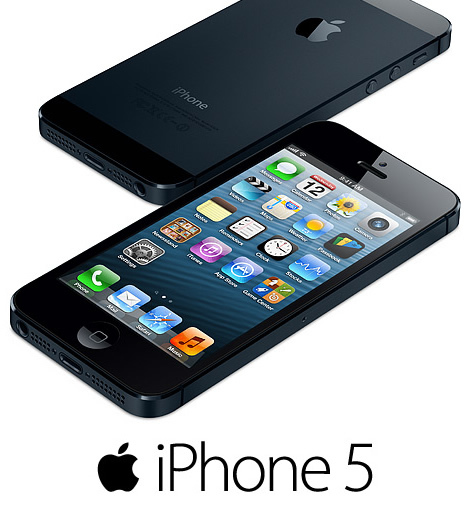 My contract is up in December so I am due for an upgrade from my iPhone 4 just in time for the holiday. 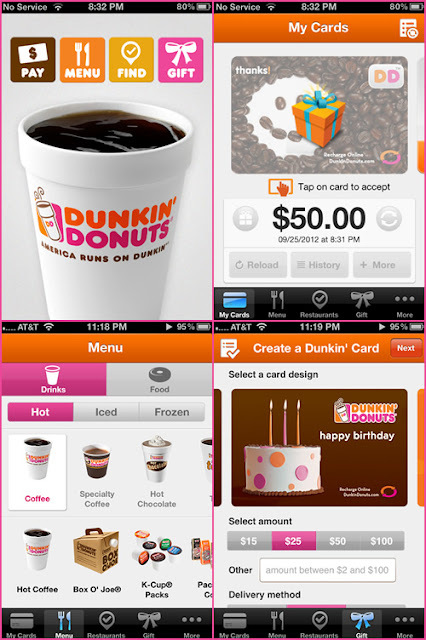 Anyone else planning on getting an iPhone 5? With the start of September also came the start of soccer for my boys. Saturday mornings have gone from laid back to absolutely crazy. To give a quick rundown, we leave the house around 8:15am to drop the 2.5 year old off at Grammy's house; head on over to the school soccer fields for 9:00am; spend over two hours on the field; drive back to pick up toddler; and then finally head home for noon. With all of the driving back and forth and the downtime out on the field, I need to keep the kids busy. 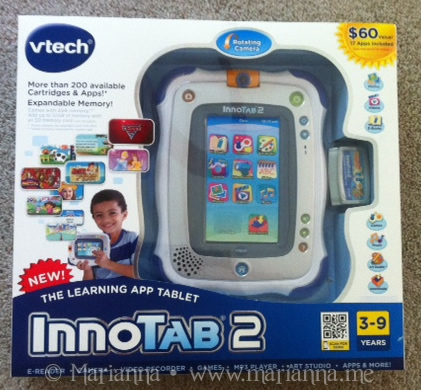 The VTech InnoTab 2 tablet for kids has been a great help for us. "This sleek and durable toy comes equipped with tilt sensor, photo viewer, video player, MP3 music player, e-reader, art studio, microphone and more all for the price of $79.99. You also receive built-in value with your InnoTab 2 purchase including one tilt sensor game, one augmented reality game, one e-book, art studio app, notes app, friends list, calendar and calculator to get started." 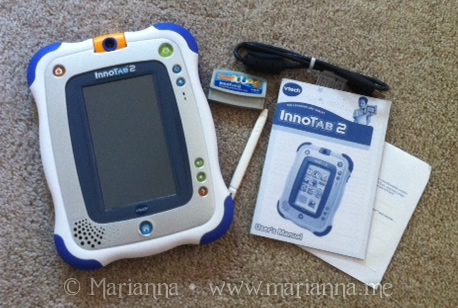 When we received our InnoTab 2 I immediately became jealous of my children because they have their own tablet now while mommy does not. And I have to say, this kids' tablet is pretty cool. Setup of the InnoTab 2 was fairly easy, which is a huge plus for any busy parent. It comes with a USB cable and an installation CD which takes less than five minutes to setup. Once the Learning Lodge Navigator software is installed, you hook up the tablet, register and then you can start downloading apps and ebooks. 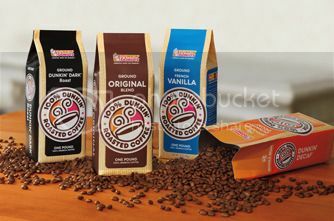 You also will get two free downloads just for registering your product. The InnoTab 2 has an easy to use touch screen and comes with two stylus pens, just in case the kids lose one. When your child is ready to get started, they set up their own profile with an avatar. 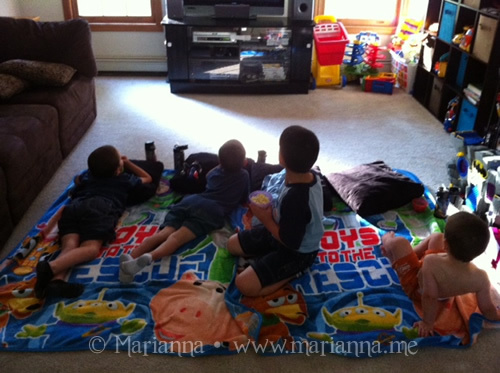 You can store up to four profiles on here which is awesome, and works perfectly for my four boys. I really love this feature as it removes any fighting of whose name gets to be on the device, which is something we experienced with the VTech MobiGo 2. 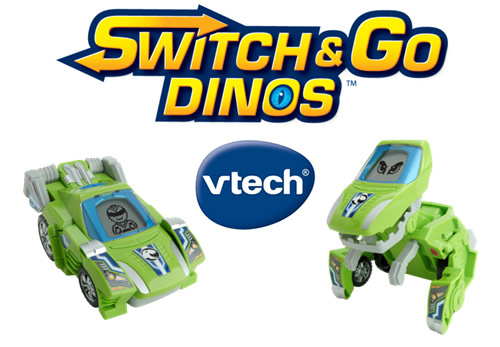 I hope that VTech adds this feature to that in the future. I have to say the boys immediately fell in love with this tablet. 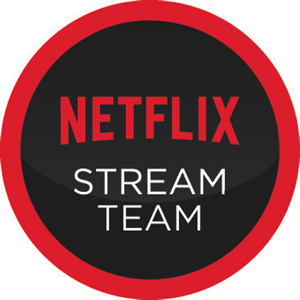 One of their favorite features has been the video recorder and they have spent quite a bit of time recording conversation between each other and playing them back. the swivel camera is also great and makes it easy to take a photo or video of pretty much anything. The seven year old also loved the MP3 Player since I put his current favorite son (Fun. 's We Are Young) on there for him to listen to. Of course there are also games, an art studio app and the e-reader app which they are enjoying as well. 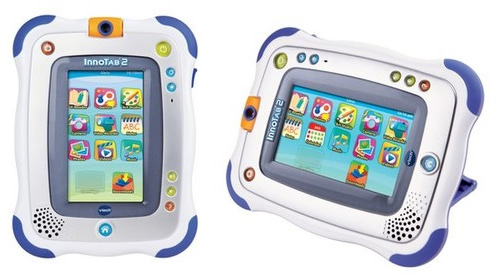 The portability of the VTech InnoTab 2 makes this product a real winner for us. When on the soccer field on Saturday mornings, the seven year old plays with it while he waits the hour for his younger brothers' game to end and his to begin. 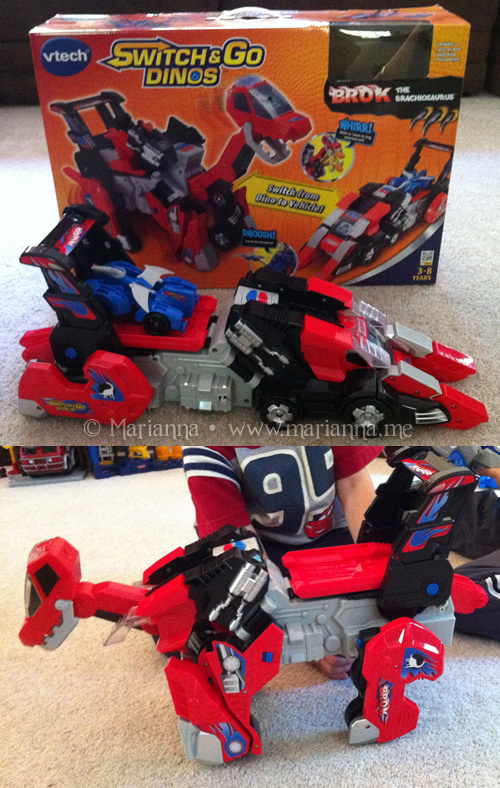 And once the twins are resting from their game with an hour to kill, they love playing with it as well. Of course they tend to fight over whose turn it is. 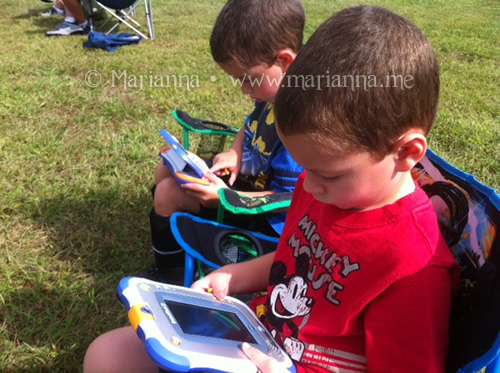 The InnoTab 2 has been a life saver for mommy during those two very long hours at soccer and I definitely recommend it as something to add to yuor gift lists this holiday season!